Bedford-Cambridge Rail Line – via Bassingbourn, Whaddon, Meldreth, Shepreth and Foxton? About 150 people attended the September 25 meeting at Shepreth Village Hall in order to hear a presentation from the ‘CamBedRailRoad’ (CBRR) group. The backdrop is the likely recommended ‘preferred route’ for the Bedford-Cambridge segment of ‘East West Rail’ – a project seeking to connect Oxford-Cambridge, with onward regional connections. An announcement is expected before the end of 2018 and the preferred option is likely to run alongside Bassingbourn Barracks, Whaddon, Meldreth, Shepreth and Foxton. It appears that the line would join the existing London-Cambridge line between Shepreth and Foxton, but you should be aware that unfortunately there are no plans for these new trains to stop at our village stations. There would of course be some significant local impacts in terms of the line running close to (or through?) some properties and requiring new level crossings. 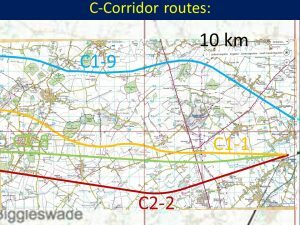 CamBedRailRoad’s proposes an alternative route along the A428 corridor on the basis that this is where the bulk of South Cambs planned population growth is focused – Bourn Airfield, Cambourne and Northstowe – yet the A428 corridor lacks a strategic public transport link. CBRR are asking for equal consideration of both schemes. 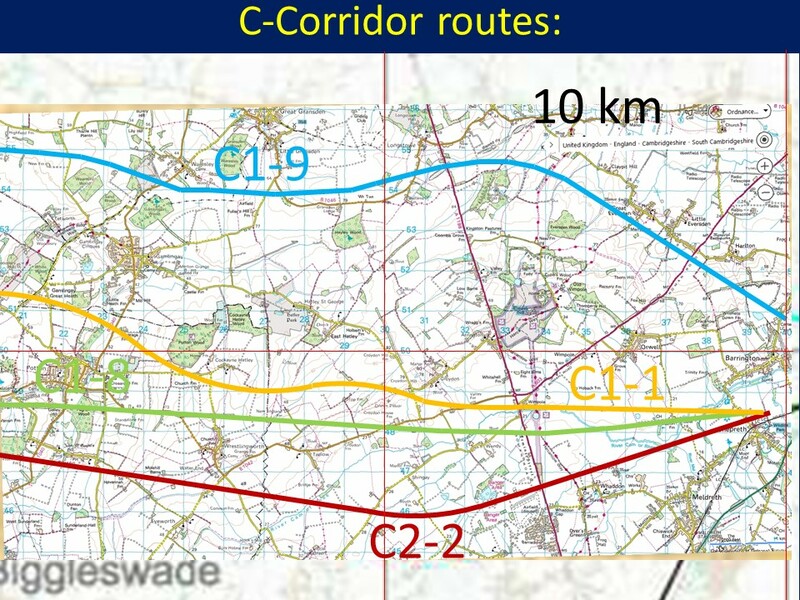 The above diagram shows roughly the current ‘preferred route’ (C2-2 is the most southerly line), as CBRR have best been able to derive from available information. Clearly all major infrastructure projects create challenges, but fellow councillors and I do feel it is important the villages are immediately aware of this as once final the final routes for consultation are announced we will have limited opportunity to influence the outcome. Please note: The preferred route came from the Jacobs Report commissioned by Network Rail, but the East West Rail project is now the responsibility of the newly constituted East West Rail Company. If you would like to learn more, there’s lots of information under the ‘Resources’ section here. Along the edge of the proposed settlement would be ‘low value’ locations, such as storage sites for the construction industry. Not sure how this will affect the appearance of my part of Bassingbourn, but it sounds like it could be detrimental. As it says on page 80 there will be heavy vehicles using the sites and accessing the A1198. The new town would be a ‘commuter settlement’ for Royston station. I hope that there is concomitant provision for increased numbers of cars parked there as there is very little public transport currently, unless this scheme proposes frequent buses to Royston starting at 5am? I’ve recently heard of a planning application for Bassingbourn Barracks to demolish some buildings and build another. Seems inconsistent with this proposal to run the railway line through the Barracks and build a new town over it. Can anyone tell me what is going on? Is my house going to be built over? Will I spend even longer trying to get onto the A1198 in the morning and evening? How noisy and litter-strewn is my local area going to get? I’ve kept myself updated on this new line but I’ve had to do the leg work and look out for updates (there was a design competition last year don’t you know!) the lines on the map have become clearer now and I can see the preferred route does now skirt north of Meldreth and south of the wInpole driveway. I’ve had a lot of time to review the proposals and would be very happy for the scheme if it was completed with both an interchange station at Foxton (or possibly a parkway station by the M11) that eliminated the level crossing and of course a new Bassinbourn station. I believe it is only a matter of time before Bassinbourn becomes a large population centre and would prefer it to have a rail link than none. It will involve some change to the area. But there is a housing crisis and we can’t complain about our friends of family struggling to get on the market and not support sensible new home schemes when they are accompanied by this sort of infrastructure investment. I believe that it is crucial to select a route via Cambourne and St Neots, whether or not it goes via Northstowe. There are several reasons for this. 1. If we get a Bassingbourn route and the development that goes with it then there will be pressure to upgrade the A10 or possibly the A603 to expressway standard. The Greater Cambridge Partnership has already been making divisive suggestions to accommodate traffic from the A14, which is to become a motorway, and the A428 expressway which is already programmed and which we are unlikely to be able to stop — especially as I’m not aware that people are even trying. I regard it as very likely that Cambridge will collapse under the weight of all this traffic, with much of its activity relocating to the outskirts and becoming poorly accessible other than by car (which will of course make the problems still worse). Now add to this a third expressway and how on earth do we even stand a chance of coping ? 2. Interchange with the East Coast Main Line will surely become a major source of traffic for east-west rail. St Neots is by far the best site for an interchange station: it has 4 platforms so inter-city trains could easily stop there without the need to spend a penny on upgrade work, it is far enough north to be attractive for people travelling from the Cambridge as well as the Bedford direction (which means that inter-city operators will have more to gain from stopping some of their trains there), and it is on the existing bus route so we can start to build up demand right now. 3. Any route that goes via Bassingbourn to get between Cambridge and Bedford will be unacceptably long and will therefore encourage people to travel by car rather than by train. I believe that the elephant in the room is the fact that for some reason former airfields are considered brownfield land and therefore ripe for development whether or not they are in suitable locations in transport terms. So, now that the Oxford-Cambridge arc has been outed as a development project, we are likely to end up with an unattractive railway service doglegging between old airfields and missing out on interchanges with the intersecting main lines (there has even been talk of crossing the Midland Main Line on an out of town site south of Bedford) for the sole purpose of being able to use airfields (and possibly old quarries) as sites for new housing and industry. Rather we should select an attractive route for the railway and concentrate our development along this route. Even if as a result it is technically “greenfield” rather than “brownfield” will people really care ? Not me anyway. This is a major proposal for our region, particularly for some neighbourhoods and heritage or natural sites. Please pass on so everyone gets a chance to comment.